Aesop was founded in Melbourne in 1987 and has since become a global brand, delivery the finest quality skin, hair and body products enriched with botanical ingredients. Whilst they are still based in Melbourne, their huge success has allowed them to open offices all around the world including in New York, London, Paris, Tokyo and Hong Kong. Aesop blend plant-based botanicals with laboratory-made ingredients to create highly effective products which are backed by scientific research. They have a team of skilled chemical scientists who work in a custom-built laboratory to research and develop ingredients and build prototypes, whilst their botanical ingredients are sourced from reputable suppliers around the globe. The combination of nature and science produces the finest products which nourish the skin, hair and body. 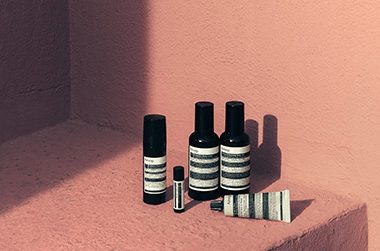 Aesop have adopted a holistic approach to beauty and believe strongly that beauty products should compliment a balanced lifestyle and offer protection against the 21st century environment we live in. Rather than packing their products full of anti-ageing ingredients, they focus on antioxidants to give your body that natural protection it needs to age gracefully. Aesop understand the damage of free radicals on our skin, hair and body so enrich all of their products with antioxidants to help neutralise the free radicals. Their Parsley Seed Skin Care range is particularly potent in antioxidant ingredients and is suitable for all skin types. They also heavily promote a balanced and healthy lifestyle as stress, smoking, an unhealthy diet and lack of sleep can all heighten the damaging effects of free radicals. All of the products from Aesop are packaged in their iconic apothecary-styled bottles and tubes, designed to add a touch of luxury to your home. Even their cult classic Post-Poo Drops have been created to look elegant in the bathroom. Aesop have developed a large product range to suit all of your beauty needs. From shampoos, conditioners and hair masks for all different hair types, to hand and body washes, hand creams and mouthwash. Their skincare range is one of their largest and features moisturisers, serums, cleansers, toners and more. Aesop are constantly developing and expanding their product range to feature new ingredients and formulas. Aesop don't believe in throwing lots of potent and active ingredients at your body in the hope of undoing any damage, instead they aim to promote prevention whilst aiding any skincare concerns. If you want to age gracefully, with a touch of luxury, look no further than Aesop. Showing 20 products of 132. I love this Lip Cream from Aesop, but I would like to rename it. This is the perfect product to apply first thing in the morning if you plan to wear a traditional, matte lip stick and am in a rush. It seems to tighten your lips, shed any excess and preps them for a layer of hydrating lip balm. After five minutes or so, you can line and apply your lipstick as it establishes a great base. I have worn this Lip Cream and nothing else underneath a matte lipstick, and regretted it three hours in. This will not hydrate lips for an extended period of time. You must turn to something else for the hydration. The fourth ingredient in this is Cetearyl Alcohol, which is why it immediately absorbs and draws in your lips. It might be good for those who accidentally wake up with chapped lips and are intent on wearing a lip product (so long as you add that coat of balm in between).